Supporting IntelÂ® Core(TM)2 Quad/Duo and CeleronÂ® 400 Sequence processors up to 3.8 GHz with 800/1,066/1,333 MHz system bus, MB930 is designed with 4 dual-channel DDR2 memory sockets to deliver up to 12.8 GB/s (DDR2 800 dual 6.4 GB/s) of bandwidth and 8 GB memory addressability. Network connectivity is provided via single 10/100 Ethernet or dual Gigabit Ethernet configuration, and on-board Serial-II ATA connectors. Expandable board also offers multiple connectivity options. Taipei, Taiwan, October 18, 2007 - IBASE Technology Inc. (TASDAQ: 8050), a worldwide leader of high-quality industrial computers, has started to sample the MB930 motherboard that is based on the Intel® Q35 Express Chipsets supporting Intel® Core(TM)2 Quad processors and Intel® Core(TM)2 Duo processors up to 1333/1066/800 MHz system bus in the LGA775 package and enabling higher performance in combination with greater energy efficiency. MB930 is the first ATX industrial motherboard to support the Intel® Q35 chipset. This new chipset allows a 50 percent power savings over the previous-generation Intel® Q965 Express Chipset. With a 13.5-watt thermal design power, the chipset is ideal for low-power systems in demanding multitasking environments for point-of-sale terminals and interactive PCs, industrial control and automation, gaming and network security applications. MB930 is designed with four Dual-Channel DDR2 memory sockets to deliver up to 12.8 GB/s (DDR2 800 dual 6.4 GB/s) of bandwidth and 8 GB memory addressability for faster system responsiveness and support of 64-bit computing. Network connectivity comes in a single 10/100 Ethernet or dual Gigabit Ethernet configuration. Serial-II ATA connectors on board offer 3Gb/s data throughput speed - faster than the most advanced parallel ATA, while offering optional RAID support. The motherboard offers expansion interface including four PCI slots, one PCI Express x1, one PCI Express x16 and one ISA slot. Other advanced features include ten USB 2.0 ports, IrDA interface, digital I/O, four serial ports and a watchdog timer. Dimensions are 12" by 9.5" in an ATX form factor. Founded in 2000, IBASE Technology (TASDAQ: 8050) is an ISO9001 certified company that specializes in the design, production, sales and marketing of industrial PC products. IBASE's R&D team is composed of talented hardware and software engineers - 50% with over 10 years and 45% with 5 to 10 years of experience in their respective fields. 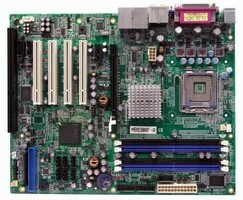 Current product offerings from IBASE include various single board computers, Mini-ITX boards, industrial motherboards, ETX CPU modules, barebone systems, network appliance and digital surveillance systems for different applications in the gaming, entertainment, automation, medical, military, network and security markets. IBASE also provides OEM/ODM services tailoring products to customers' requirements. For more information, please visit www.ibase.com.tw. IBASE Technology Inc. is an Affiliate Member of the Intel® Communications Alliance, a community of communications and embedded developers and solution providers. For more information, please visit http://www.intel.com/go/ica.